Ever since my childhood, Jungle Book to me had been all about the very famous “Jungle Jungle pata chala hai, chaddi pehen ke phool khila hai, phool khila hai”. 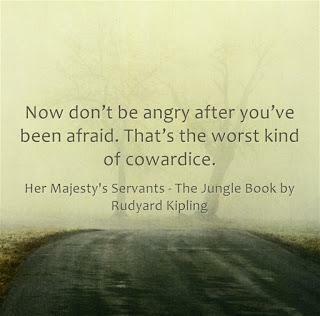 I downloaded the “The Jungle Book” to read the actual version of same and it took me to a total surprise – a pleasant one indeed. 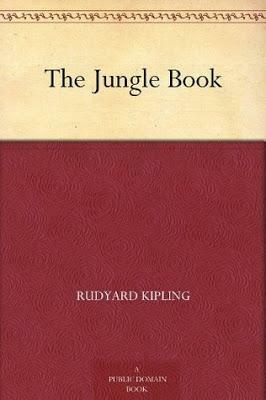 The book is a good mix of five (most popular of all - the 'Mowgli' is actually divided in three stories.) stories. All the stories are followed by a related poems/songs/rhymes. All the poems summarize the nature of animals and their lives in the preceding story. 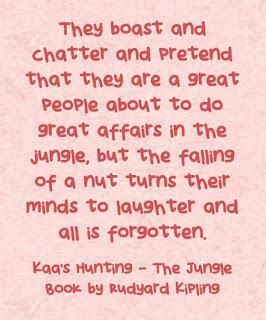 I think I might be repeating myself from my earlier posts that there is a reason some books are termed "Classics". 1. Mowgli's Brothers - Childhood hero Mowgli being rescued and raised by wolves and the realization of animals that he is a man after all! This chapter is the one we all know much about. Wolfs always hunt in pack and they ought to have few lines to get them going. "Hunting Song of the Seeonee Pack” helps them to remain focused and follow their leader. 2. 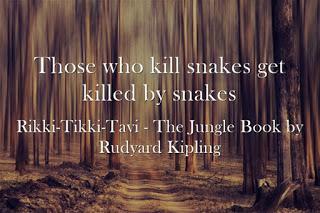 Kaa's Hunting - Big hypnotizing python - Kaa is helps Baloo and Bagheera to rescue Mowgli from the "Bandar-log". I found this song very close to monkeys or at-least how we perceive them. The monkeys found pride in the song while Mowgli realized that this was not an environment he could enjoy for long. It's called the "Road Song of the Bandar-Log". 3. Tiger! Tiger! 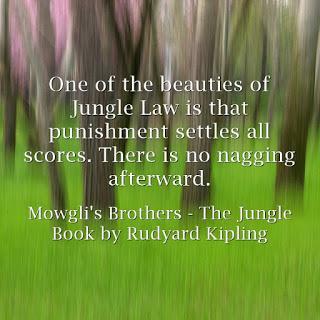 - The final of Mowgli's series where he goes to a village where humans live. But then, Jungle is where his heart belongs to. 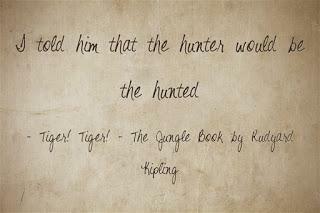 He along with his wolf brother finally brings an end to the cruel Shere Khan. Finally, Mowgli sings "Mowgli's Song" with much pride and tells everyone about his victory over Share Khan. It's popularly known as the victory song, but I could not help but notice the tiny elements of sadness in verses. Life sure is unpredictable! 4. 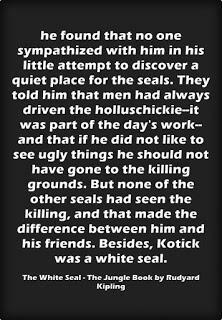 The White Seal - It's a brave story of Kotick - a rare white seal who decides to find a safe place for his fellow seals. Honestly speaking, this one is my favorite of all. There are so many takeaways from this little story with respect to 'modern society' we are living in. This story might make way to another post from my end. The "Lukannon" song - which I found a bit sad does a good justice to the story. Reading the verses shows why Kotick decided to follow a path which was discouraged by all but was much needed at the same time. 5. Rikki-Tikki-Tavi - A mongoose named 'Rikki-Tikki-Tavi' finds himself rescued by a family of humans and returns the favor best by rescuing them back by a family of Cobra. The tailor-bird "Darzee" sings in celebration as Rikki-Tikki-Tavi hunts cobra and made the garden a safe place to live for other creatures. The song is titled - "Darzee's Chaunt". 6. Toomai of the Elephants - World of Elephants has always been of much interest ever. 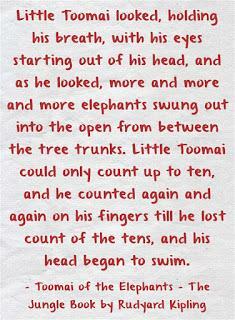 It's a nice story about little boy Toomai and his adventurous encounter by elephants - of all types! Wait before you think that the story has come to an end. a beautiful song Little Toomai‘s mother sang to him when he was a baby awaits next. It's a gorgeous song depicting the law of nature called "Shiv and the Grasshopper". Toomai‘s mother explains that the creator - Shiva is the one who "made all" and also ensured that all are fed leaving no one hungry. 7. Her Majesty's Servants - What happens when animals from different regions or work culture meet? What do they discuss? This short story is a compilation of one such event when mule, camel, horse, elephant and bullock spend the night together and discover new things about each other’s work - obviously each thinks theirs is better than others. The story is followed by "Parade-Song of the Camp Animals" - a enthusiastic song where each group gets to echo their own verse and then a common one. All the stories depict the world through the eyes of animals. They also focus on the basic nature of animal in picture turning it in the form of a tale children might enjoy. I would however like to give a disclaimer warning that it's nowhere near to Disney's magical world and might crush those sugar-coated images of animals we have built. As a child, I might not enjoy it originally and thus think that it's justified to tweak them a bit when it comes to presenting the same to children. Very rarely I write this - Go for it with open heart! You would not regret the time invested. I Loved it thoroughly. Need more reasons to add it to your library - It's free on Kindle!